Mr. prakashbhai is my financial adviser for last 18 months. I have come to appreciate his transparency and honest suggestions. He has very disciplined and systematic approach. He is prompt and thorough in implementation. It has been an enjoyable and meaningful association with him. I am a practicing physician in the United States of America. I have known and invested with Mr.Prakash Lohana, founder of Ascent Financial Solution, since 2007. He is a very knowledgeable and extremely humble individual and his professionalism has been exemplary throughout the time I have known him. He always has time to go over his investment strategies with his clients and has the aptitude to explain his decisions to those who do not have a background in the financial sector. Mr. Lohana listens to his clients needs, understands their goals, and is able to follow through and deliver results. He has also gone above and beyond by suggesting investments to his clients in which he has no gain; such as; advising how to investment in banks directly. I feel very fortunate to have come across Mr. Lohana, he has certainly helped me to attain my financial goals. I am an NRI from United States .Through a common friend I have known Mr.Prakash Lohana, founder of Ascent Financial Solution, for nearly eight years . Initially I was very reluctant to consider investing in India. Following two successive meetings he convinced me why investing in India, is far more fetching than perceived otherwise. In the financial world he is extremely knowledgeable . Three years back he had predicted what the stock market scenario would be today. His market analysis is as precise as it can be. Mr. Lohana makes time to listen to his clients needs, understands their goals, and delivers them results. He has also helped me in picking my funds for 401K in my present job in U.S. He is always very prompt to respond to any queries that I may have. Mr Lohana is very honest, humble and extremely professional in all his dealings. I feel extremely lucky to have found Mr. Lohana, as my financial consultant. He has certainly helped me meet my financial goal. I have recommended his name to my friends who are looking for investing in India. I am a practicing Chartered Accountant. Ten years of my practice left with me no time to manage my own finances. I was very cautious in delegating my personal financial matters to anyone. But when I met with Chief Financial Planner of Ascent I realized that he is the one who is competent and can manage my personal financial matters better than me. Today I am happy of my decision on choosing Ascent as my Financial Planner. They put the best for me. Nirav Shah â€“ Chartered Accountant Nirav Shah & Associates. Ascent in real sense is an Advisory firm. Unlike most other Financial Advisors they are not sales motivated. Their proactive approach to financial planning has already put me in much stronger position. With their help and advice, I hope to build upon this foundation so that my future is secure. I think Ascent team is the one that I can completely trust and therefore I have no problem in recommending them to any friends or colleagues. First, birth and education: Normally up to 25 years of our life we depend upon our parents for all our financial needs. 2. Second stage is the working life of a person where he starts earning and then different events of the life like marriage, kids, house, car etc. happens. All these events have financial implications. Everything is linked with money. As the life progresses you are so busy that cannot focus properly of financial part of the life and your financial life gets unorganized and this has severe implications later on. Financial planning is an approach which keeps your financial life healthy and organized. Financial Planning is the process of meeting your life goals through available resources in the best possible manner. A Systematic Process: Financial planning is a six step process, this means that there is systematic series of action to organize and manage your financial affairs. This process is defined by Financial Planning Standards Board of India. 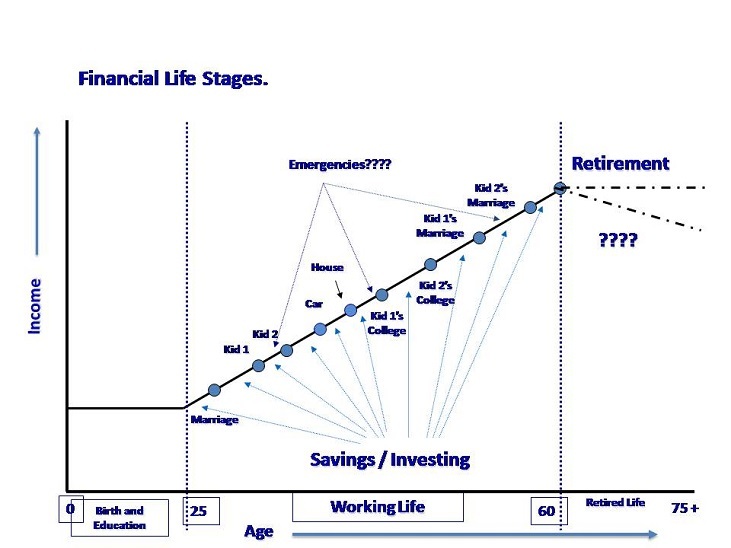 Your Life Goals: The entire focus of financial planning process is meeting your Life Goals like Retirement Planning, Higher Education Fund planning for your children, etc. As against this, traditional approach of investment never focuses on life goals. It only focuses on financial products. Available Resources in the Best Possible Manner: Financial planning focuses at optimization of your current resources and future resources to meet your life goals. Financial planning always aims at optimization and not maximization because maximization means maximum risk. Now you may not need to take that much risk and it may lead to losses in your investment. Let us take a simple example to understand this, suppose you are travelling from your office to home and distance is 10 kms and you have sufficient time say you have 1 hr to reach, now will you drive at higher speed in a crowded area? No. But say someone is suffering from heart attack and you have to reach hospital at the earliest now you will try to drive at higher speed. Similarly, you have to check how much risk you should take to meet your life goals, if you are meeting your life goals easily with available financial resources why should you take higher risk when you can avoid it. All these aspects are thoroughly taken care in financial planning. Financial Planning focuses on you. Financial planning focuses on your circumstances and needs. It is customized for your financial life and tries to optimize your financial resources. 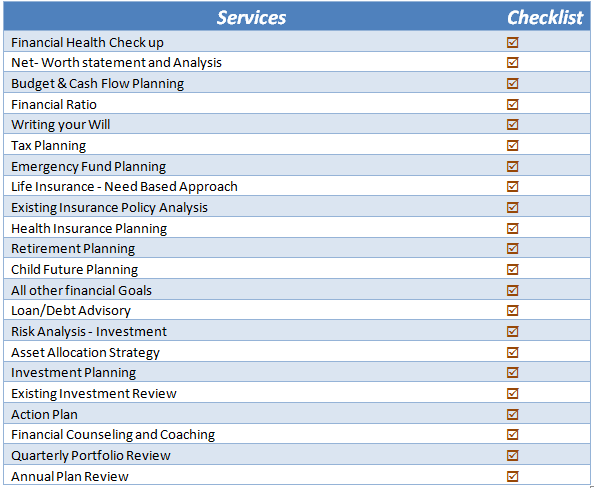 What Our Financial Planning Service will Cover? We request you to fill following details to have primary interaction with us. Here we will explain you our process and would like to understand your circumstances and expectations. If you are based in Baroda, we can have one to one meeting otherwise we can connect through phone or skype/Google hangout/ Gtalk .